An Awesome Sketch Challenge with the Paper Craft Crew! Hello stamping friend, and welcome to another terrific challenge with the Paper Craft Crew Design Team! I was sad to have missed out on last week’s challenge (this cold has been brutal!) but I’m back, and I hope you’ll join me! As soon as I saw the image at the bottom right of the sketch, I knew I wanted to bring out my Cupcakes & Carousels Embellishment Kit! I had just received it, and was dying to have a play with it! My card base is Very Vanilla cardstock. To replace the ‘swirl’ in the sketch, I decided that I needed to replace it with something birthday-ish, so I decided on the confetti image from the Balloon Adventures stamp set. I stamped the confetti in Bermuda Bay, So Saffron and Calypso Coral inks; pulling the colours from the Cupcakes & Carousels Designer Series Paper. I then pulled my Timeless Textures stamp set out, and stamped the dots image stamp in Calypso Coral ink across the bottom of the card front. I layered a strip of Bermuda Bay cardstock under the strip of harlequin patterned paper from the Cupcakes & Carousels DSP, and glued them to the right side of the card front. I used Bermuda Bay to stamp the sentiment on the tag from the Embellishment Kit – I just love the gold embossing around the edges! The little bow (also from the Embellishment Kit) has an Enamel Shape in the middle, and a length of Calypso Coral 1/4″ Ombre Ribbon underneath it. It’s attached to the bottom of the tag shape with Glue Dots. I just love how this card turned out, and how quickly it came together! I’m so happy that I got the Cupcakes & Carousels Embellishment Kit – I know I’m going to be using it all up, quickly! 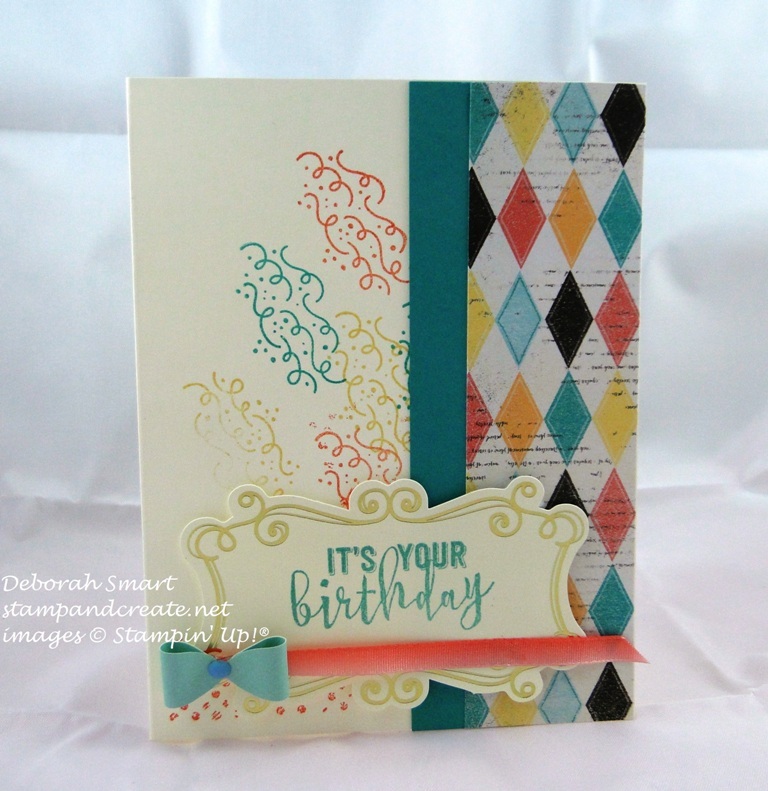 So, let me know what you think about this card, and if you’ve bought the Embellishment Kit! Finally, head over to the Paper Craft Crew Challenges blog, and see what the other Designers have created. Be sure to link up your own card for the challenge, too. If you don’t already have your own demonstrator, and want to order the supplies for this card, just click on the images below. You’ll be taken directly to my online store. Until next time -happy stamping! Lovely card, Deborah!! Such happy colors – and I love the C&C Embellishment Kit. Such a cute card. I love all the confetti!